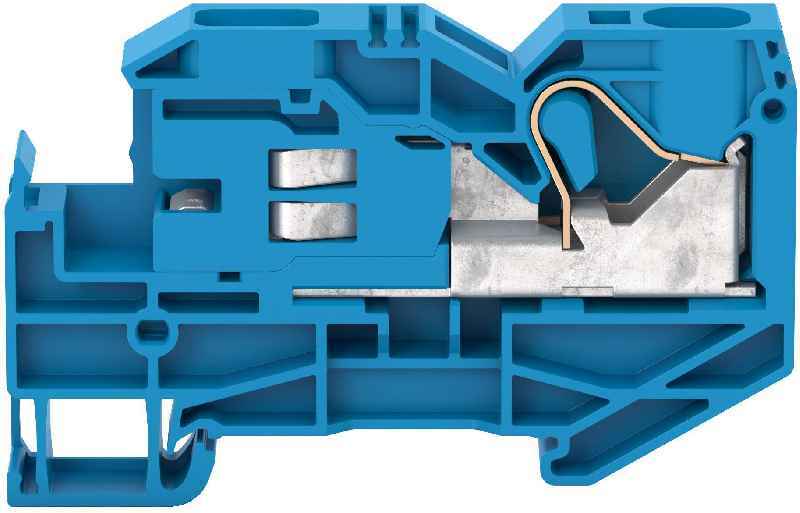 CONTA-CLIP expands its range of single-level push-in installation terminals, adding the FNT 16 neutral disconnect terminal for wire cross sections between 2.5 qmm and 25 qmm (up to 16 qmm with wire-end ferrules). The push-in connection system allows for safe connection of wires without tools. When a solid wire or ferrule is inserted, the pressure spring opens automatically and establishes a secure contact. Standard screwdrivers can be used to connect and disconnect flexible wires without ferrules. 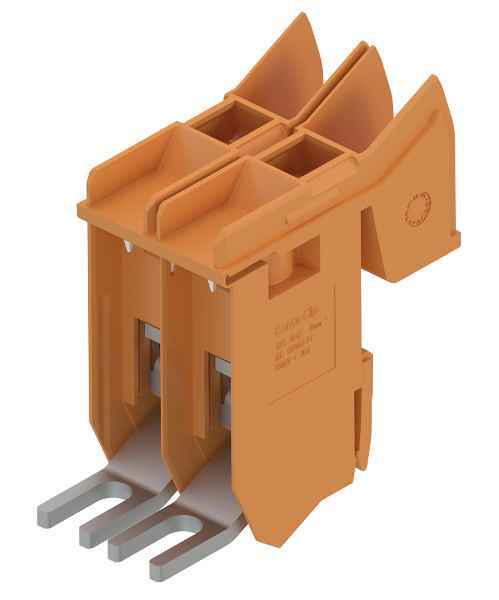 The disconnect terminal integrates a receptacle for the 10×3-mm neutral busbar. There is no need for an additional fixing plate. 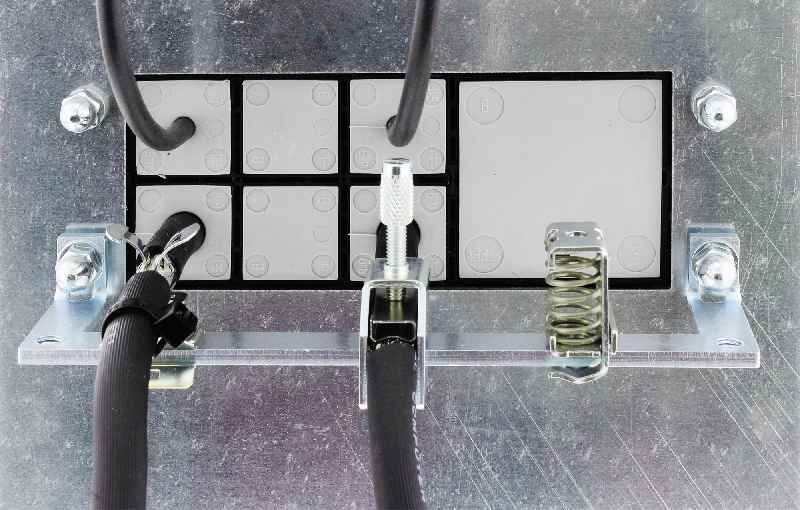 The neutral busbar is securely connected via a screw-less slider. 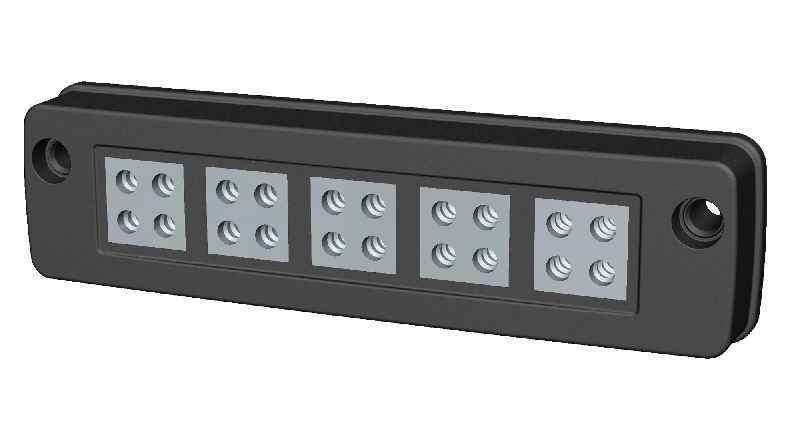 Like FRKI feed-through terminals and FSLI PE terminals, the neutral disconnect terminals can be used alongside FDLIS three-level installation terminals, because the position of the neutral busbar is identical in both versions. 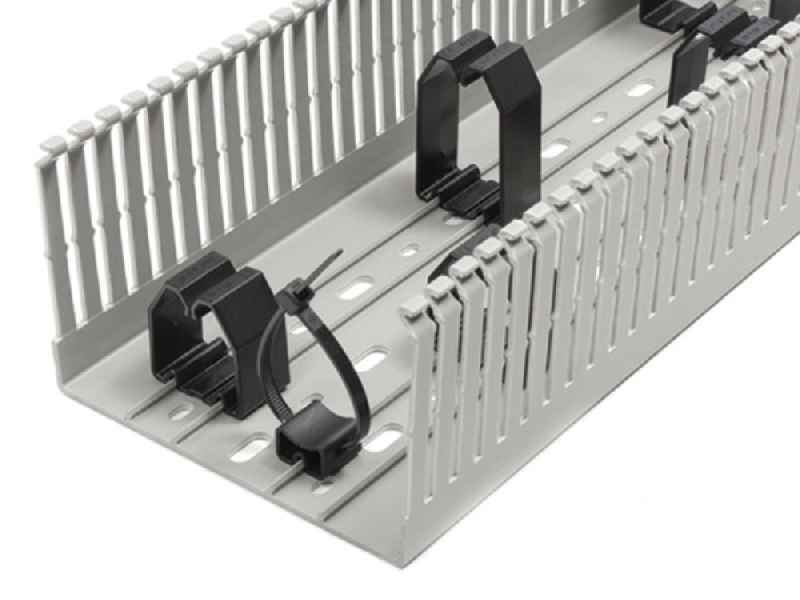 Accompanying the KDSClick cable entry system, CONTA-CLIP supplies easy-to-install, galvanized EMC rails for safe and secure shield termination of cables. KDS-EMV-SAB type rails are attached to the KDSClick mounting screws inside control cabinets and secured with a nut. The manufacturer’s SAB program also includes spring-loaded and screw-connection clips for all cable diameters. These ensure large-surface grounding. In addition to shunting electromagnetic interference, the shield-connection clips provide strain relief. With the KDS-FP flange plate, CONTA-CLIP take the tool-free click-and-push concept of their cable entry system KDSClick to a larger scale for control cabinet construction. 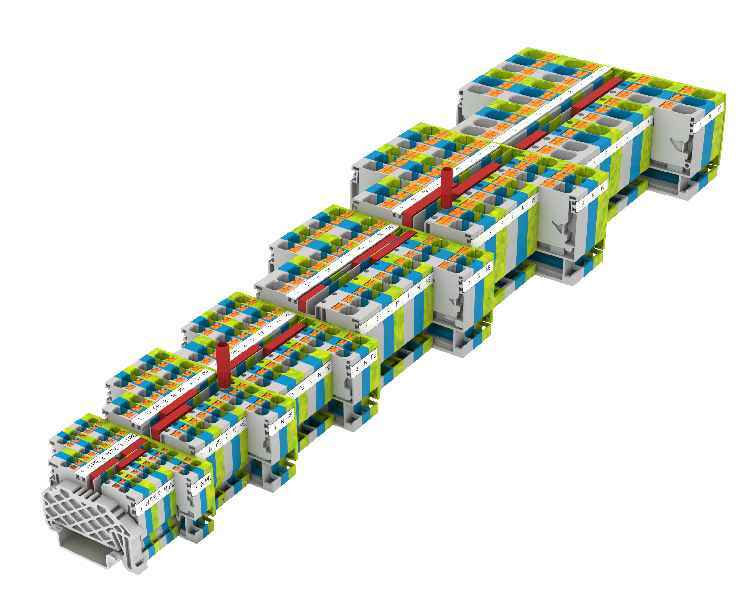 With this system extension, the connection technology experts primarily address the needs of series machine and special purpose machinery manufacturers, who are dealing with wiring requirements for cabinet packing that keep changing all the time. KDS-FP is an extra-flexible solution for managing cables and pneumatic or hydraulic tubes: the number and diameters of the required openings can be seamlessly adapted at any time without drilling, sawing or other machining. At all times, the system reliably provides IP66 sealing. First, a cavity with standard dimensions in the cabinet wall is fully and tightly sealed by screwing on the flange plate. Then, up to three plate segments can be broken off at predetermined breaking points as needed without the use of tools. Each removed segment reveals a 40x110mm duct that can be further divided into up to ten frame openings by snapping frame inlays from the KDSClick series into place. The inlays are available as plain partitions, T-pieces or cross and double cross form to allow for the required custom dimensioning of the frame openings. CONTA-CLIP offer a continually expanding range of different sealing elements (currently numbering about 100) for sealing lines and tubes of various diameters as well as feeding multiple cables through one frame opening. The sealing elements, which feature a crinkle cut at the side, are simply placed around the wires and ensure not only a precise and tight seal but also provide the connections with a reliable strain relief. After the wires are sheathed, the elements are inserted from the inside of the cabinet and pushed to the outside through the frame openings defined by the inlays. Thanks to the conical tapering, the sealing elements are easily and effortlessly pushed into the frame opening/inlays and just as easily removed for new or additional wiring. Unused frame openings are safely closed off with sealing plugs. This ensures comfortable changes to the wiring, even for single cables, without having to disassemble the frame. Two flange plate types are initially available: KDS-FP-2×10/24 and KDS-FP-3 x 10/24 for up to 20 or up to 30 configurable frame openings, respectively. More form factors are already in development. 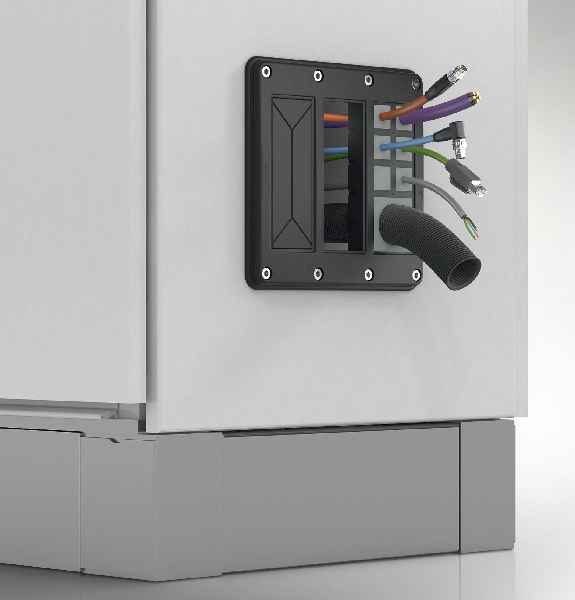 For users who want an additional strain relief of the cable towards the inside of the cabinet, a locking accessory for sealing elements provides a toolless solution that can be clicked into undercuts at the back of the flange plate. CONTA-CLIP presents the new Push-in terminal series PRK. The comprehensive range provides users with a number of design improvements on conventional Push-in terminals and satisfies even very demanding requirements regarding ease of use and mechanical stability. The Push-in connection ensures a safe, tool-free insertion of rigid wires or wires with end sleeves and significantly reduces the time spent on wiring. For a quick release of inserted wires, the terminals are equipped with a pusher that requires only slight pressure and no special tools, although the Push-in-springs provide high contact force for the wire connections. Improving on conventional Push-in terminals, accidental incorrect insertions of wires are made impossible due to the physical separation of the insertion channel and pusher. The completely new internal layout with large contact surfaces and fixed metal parts ensures a high current-carrying capacity with low heat build-up, mechanical toughness and an absolutely secure hold of the compact terminals. All potentials have a test point for easy measurement. PRK range feed-through and PE terminals are available for six nominal cross-sections from 1.5 mm? to 16 mm? in versions with two, three and four-wire connectors suitable for wire cross section from 0.34 mm2 to 25 mm2. The protective-conductor terminals are equipped with a foot contact on both sides to ensure maximum electrical and mechanical reliability. In addition, CONTA-CLIP offers the plug-in cross-connection system PQI for quick and convenient potential distribution. Standard terminals with rated cross-sections from 1.5 mm2 to 10 mm2 can route two potentials within the two cross-connection channels. All insulating materials used in the PRK series are free of harmful substances and meet the V-0 self-extinguishing fire classification according to UL 94. 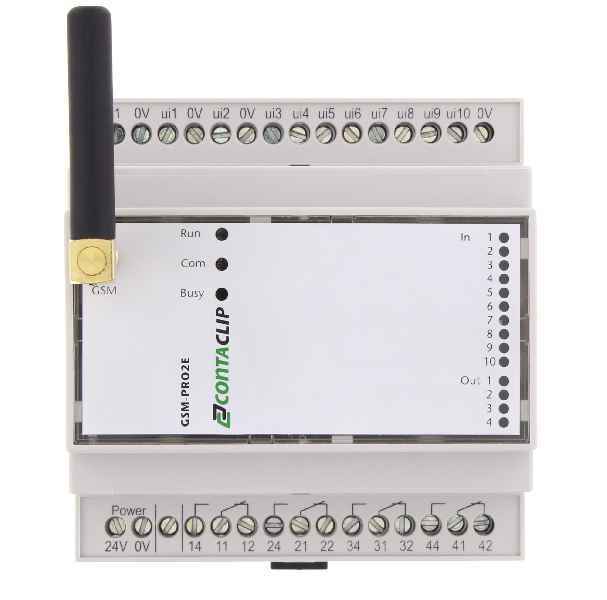 I/O communication modules from CONTA-CLIP’s GSM-PRO series provide easy-to-use and economic solutions for remote monitoring, control, and maintenance of distributed applications via mobile networks. Now, the connection technology specialist replaces the first generation with the new, same-size versions GSM-PRO2E and GSM-PRO2E-GPS. I/O communication modules from CONTA-CLIP’s GSM-PRO series provide easy-to-use and economic solutions for remote monitoring, control, and maintenance of distributed applications via mobile networks. Now, the connection technology specialist replaces the first generation with the new, same-size versions GSM-PRO2E and GSM-PRO2E-GPS. The new I/O modules also have four relay outputs. But instead of eight, they feature 10 inputs. The I/Os can be configured for digital (24V DC) or analog (0…10V and 0…20mA) signals, as required. If users need more inputs and outputs, they can simply add them themselves by inserting E/A extension modules. The new communication modules moreover feature a counter input with a counting speed of up to 1000 pulses per second. In cases of input values exceeding or falling below defined thresholds, GSM-PRO2E can automatically notify up to 10 persons per input via text or email. Contacts for individual or group alerts can be selected from an integrated address book. Conversely, control-room staff or service technicians can switch digital relay outputs by text message or phone call. GSM-PRO2E provides various logging functions for keeping track of communication events, process values from analog inputs, and the activation of inputs and outputs over time. Users can read out log files via USB or have them sent via email. The accompanying software enables easy parameterization without programming skills. Even after installing and commissioning the modules, firmware updates and online configuration changes can be easily carried out at any time via the GSM network. Users can simply export complete configurations to other modules to minimize the effort for implementing serial applications. An app for iPhone and Android devices enables fast and easy monitoring and control of the communication module and allows for a quick overview of the status of all inputs and outputs of several GSM-PRO2 modules at once. The new cable entry system KES features a very high packing density and provides IP66 ingress protection. 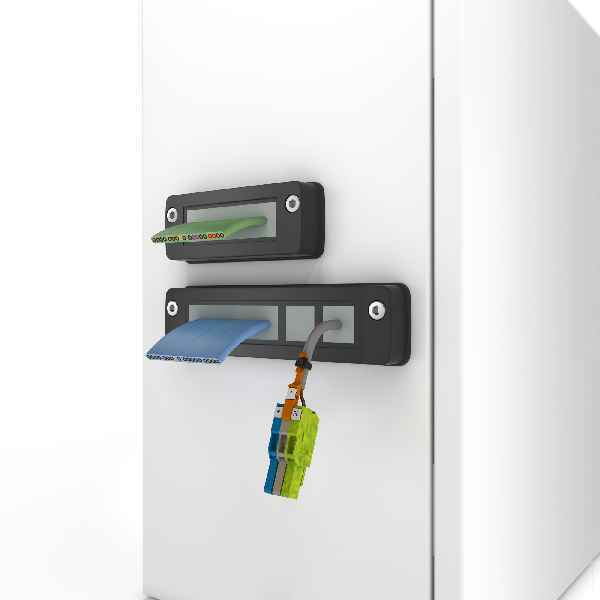 The new KES series of gland plates from CONTA-CLIP enables the quick and safe introduction of cables and tubes without connectors into cabinets and machine housings. 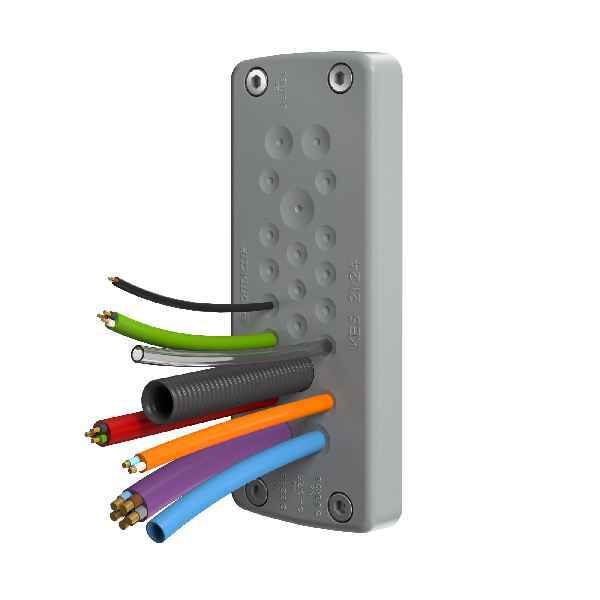 KES plates provide IP66 ingress protection with no need to specially fit and secure cables with screws. The robust polyamide frames filled with elastomer are placed on the outside of the cabinet or housing wall and fixed with screws onto 36 mm x 112 mm openings. The plates feature a low profile height of only 14 mm. For a toolless installation, they can also be snapped-on. In this case, the screw holes remain completely sealed thanks to the layer of elastomer. To insert cables, the outer membrane of the gland plate is pierced with a pointed tool at a designated entry point. The wires are then simply pushed through. Aside from the punctured membrane, the conical entry grommets on the back of the plate provide an extra double sealing of the cables with IP 66 ingress protection as well as reliable strain relief. 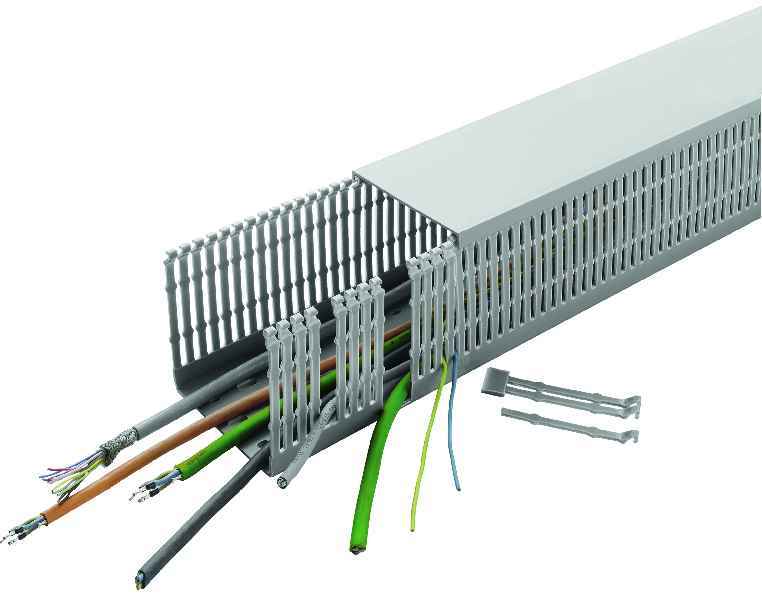 This new concept accommodates up to 32 cables per plate, achieving a much higher packing density than conventional screw-fitted cable entry solutions. CONTA-CLIP is launching the new KES plates in 24 variants designed for different maximum numbers of lines and cable diameters. The elastic cable guides are suitable for cables or pneumatic lines with diameters ranging from 3.2 mm to 20.5 mm. The cable entry system’s advanced IP66 ingress protection enables use in harsh environments. KES also features smooth surfaces, rounded corners and ECOLAB certified resistance to industrial cleaning products, and therefore provides all necessary hygienic properties for use in the food industry or in pharmaceutical production.